The fantastic wordless books by David Wiesner are a wonderful addition to your bedtime reading routine. Each of Weisner's wordless books is akin to a dream. The stuff of imagination comes to life on the pages of Weisner's books. The absence of words only serves to highlight the fantasy lands that Weisner portrays. David Weisner (weez-ner) is a three-time Caldecott medal winner who is best known for his wordless books. His career began as an illustrator but ended up writing and illustrating his own books -- many wordless and some with words. NOTE: I do share some story spoilers since my assumption is that this page is being read by parents looking for books for their children. When I choose books, I want to know everything possible. So I apologize for ruining the surprises in some cases. Tuesday is representative of Wiesner's work -- magical stories where imaginations come to life in beautiful illustrations. 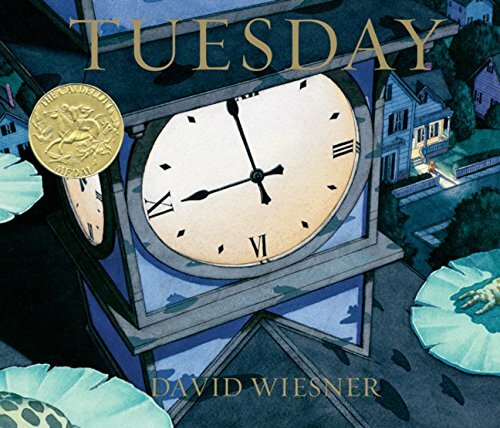 Tuesday was my introduction to David Weisner. It's Tuesday night, and the time is right for odd happenings involving frogs flying on lilypads. The resulting chaos is hilarious and whimsical. Dogs and cows are surprised, people are shocked, and the evidence the next morning gives the police quite a mystery to solve. The best part of the book is the ending that makes you long for a sequel. Tuesday was awarded the Caldecott Medal in 1992. What a delightful book. An inquisitive boy playing on the beach finds an underwater camera, washed ashore. After developing the film he finds inside, he discovers fantasy underwater scenes and then a photo of another child. After looking closely, the boy discovers a photo inside a photo inside a photo. When he sees the pattern, he takes his place in the cycle by photgraphing himself and throwing the camera back into the sea. Small children may not understand this book without some explanation. For independent reading, this book suits grades 4 and above. 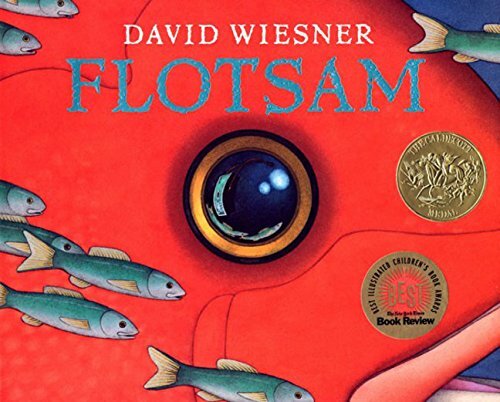 Flotsam was awarded the Caldecott Medal in 2007. Wiesner's books amaze me. I thought Tuesday was my favorite until I read Flotsam. Then I thought Flotsam was my favorite until I read Sector 7. I adore this book! It is by far my top pick among David Wiesner's wordless books. The book is slightly reminiscent of Snowman by Raymond Briggs, but with a technological twist. That twist is Sector 7, a cloud factory that hangs in the sky and serves the New York area with white puffy and very rounded clouds. In the book a boy goes on a school field trip to the Empire State Building in New York City. While he is on the observation deck, he befriends a cloud. (Yes, the cloud is a character and has a distinct personality.) After some silly antics, the cloud takes him on a flight to Sector 7 where clouds are designed, ordered, and commissioned to populate the sky of New York. The problem arises when the boy begins designing clouds in very untraditional shapes -- giant squids, pufferfish, and turkey fish. The men running Sector 7 are flabbergasted. The cloud making officials catch the truant boy and have him sent back to the Empire State Building but not before a huge population of fantastic clouds fill the skies. The original cloud friend returns home with the boy, though, and the ending has a sweet feeling of friendship. 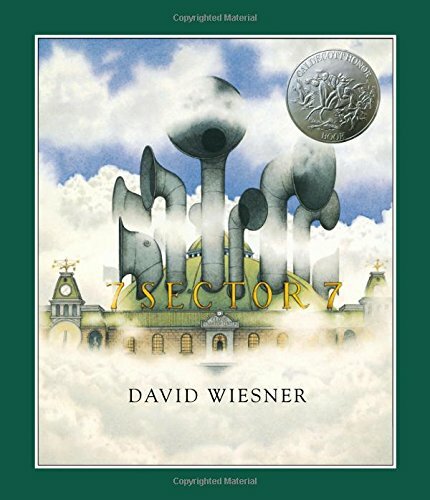 Sector 7 received the Caldecott Honor Medal in 2000. Free Fall would serve as a perfect, child-friendly introduction to surrealism. In this wordless book, a boy's dreams take him from one fantasia to another, with the different worlds seamlessly morphing into the next. Wiesner does a great job of portraying how dreams do seem to randomly and illogically change while maintaining some elements such as certain characters or objects. Free Fall is different from Wiesner's other wordless books in that there is not a single plot line to follow. Instead, the book is a collection of scenes that eventually lead the boy back to bed, asleep. 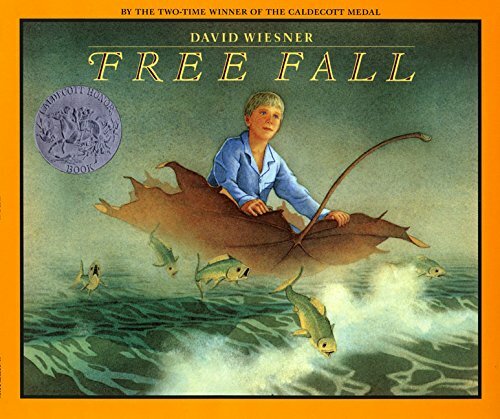 Free Fall received the Caldecott Honor Medal in 1989. Wordless books are great. We used to use them years ago when working with preschool children with language delay. Why have I not heard of David Wiesner before now? I love wordless picture books and these sound amazing!